For me, the best types of history books are the one that look at something that seems innocuous, but turns out to be a small part in a much larger story. 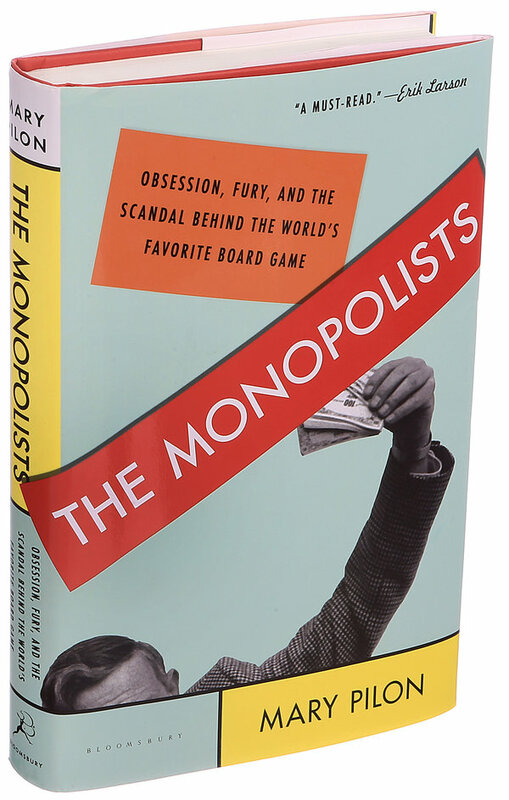 Mary Pilon's history The Monopolists: Obsession, Fury, and the Scandal Behind the World's Favorite Board Game is one such book, and it's an excellent look at the history of the board game Monopoly and how its history is murkier than one would ever expect. The board game you likely played as a family has a long, fascinating and exciting story behind it, and a story that ties into tax philosophy and business practices from major game maker Parker Brothers. The commonly recounted history of the game goes like this: one man, Charles Darrow, unemployed during the Great Depression, went into his basement to make up a game to keep his family entertained through the dark times the country was going through. He emerged with Monopoly, and ended up selling it to Parker Brothers. He gets paid, Parker Brother has a hit on their hands, and the country gains a beloved pastime. That's not the full story, however. Pilon recounts the story of Lizzie Maggie, an advocate for a single-tax system and feminist activist who came up with the game's immediate forerunner, The Landlord Game, patented it and continued on her way. Interestingly, the game was one that sought to demonstrate how rent created wealth inequality. Over the following years, the game and numerous imitators sprang up across the Northeastern United States, particularly in Quaker communities. From the early 1900s, the game was a popular pastime. In the 1930s, Darrow was introduced to the game, and after some tinkering, he sold the game to Parker Brothers, passing it off as his own creation. The company didn't look too deeply into Darrow's story, and pushed his own creation narrative on the public, and it slowly became accepted fact as the game's popularity skyrocketed. This is a story of intellectual property, and Pilon deftly picks up the story with an economics professor, Ralph Anspach, who had created a game titled Anti-Monopoly. His game touched off years of litigation between himself and Parker Brothers, who had aggressively defended their product and its trademark. In the course of his work to try and save his own game, Anspach uncovered much of the hidden history of the game to support his legal argument that Monopoly had been widely known to the general public. Pilon goes through the history of Monopoly's predecessors to help with the main objective of the book: looking at how Parker Brothers took the game over, repackaged it and maintained a firm hold on the game, warding off any potential competitor through litigation: ironically, creating a monopoly of their own. Parker Brothers doesn't come off well here, and this is where the book feels like it could have been a bit better. A disclaimer in the back of the book notes that Parker Brothers refused interviews, which is a shame: there's an interesting story from their side about how they created a national past time, especially when you begin to consider how important they are to the board gaming industry. Some of the more interesting parts of the books are the insights into the formation of Parker Brothers. Additionally, the last half of the book is wholly focused on the trial and legal issues: it makes for an interesting David and Goliath story, but I guess I was hoping for a bit more. Parker Brothers has exploded the game in the last couple of decades, from publishing licensed versions of Monopoly (I have a copy of the Star Wars version at home), to the games companies like McDonalds and Shaws have run year after year: there's nary a mention here, which would have been interesting to see. Regardless, The Monopolists does what most good, readable (read: Non-academic) nonfiction titles do: they present an interesting and exciting story that plays out well and serves to look at the much larger picture surrounding it. Here, we see a bit of the social fabric of the United States at the end of the 1800s and well into the 1900s. For me, fondly remembering the endless games I played with my siblings, it's an interesting read that imparts some new trivia and context for those many hours we spent passing go and collecting $200.